Overlooking the sea and Playa de la Torrecilla beach, the Riu Monica is an attractive and traditionally Spanish style hotel surrounded by attractive gardens. The hotel is ideally located for a relaxing break in this beautiful resort. 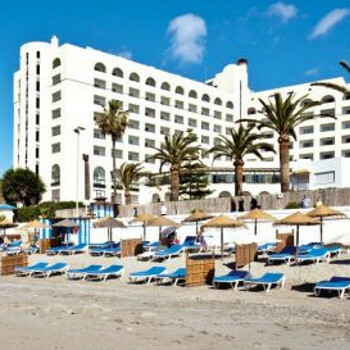 The Riu Monica is a nice hotel with direct access to the nearby beach. Near the hotel there is a good beach bar which served fresh fish every day. The old town of Nerja was only a ten minute walk uphill and was very pleasant to visit. Whilst our room had a good view of the beach and the surrounding sea, it was also over the dining room and every morning you could smell the bacon cooking. Breakfast was a typical Spanish hotel buffet but the evening meal has two sittings, with guests queuing up 5 minutes before the opening time. This made it feel a bit like school dinners at times. Overall we had a good holiday and would use the Riu Monica again but only if the price is right. On arrival we were greeted with a champagne reception made to feel very welcome. The hotel was spotlessly clean and towels changed daily. We arrived late at night but a lovely buffet was laid on for us. The location was good only about a 10 min walk into main shops. There was entertainment every night and they tried to cater for all tastes. I would definitely go back to this hotel again. Our party of 4 had stayed in Nerja on 3 previous occasions, but this time felt we would like to go a little "upmarket". Without doubt it was a good choice. Whilst we were checking in we were offered a glass of cava, and this proved to set the standard of service for the rest of our stay. The bedrooms were large and attractive and the beds were very comfortable. In the Dining Room the range of food was amazing, from breakfast, where you could have a great variety of fresh fruit, meats, cereals, bread and cakes as well as freshly prepared hot food such as bacon, eggs, sausages and pancakes, to dinner where there was a selection of soups, a large buffet table and freshly cooked hot dishes along with a large variety of delicious deserts, all replenished regularly. The Dining room staff, just like the rest of the staff, were always friendly. The pool area was very pleasant, no towels allowed on sunbeds before 9 o'clock. The only slight downside was the entertainment of a night, but this did not bother us unduly as the joy of Nerja is in sitting outside cafes watching the world go by.We are looking forward to going back to Nerja again and will certainly be staying at the Riu Monica. This had to be one of the best holiday hotels that I have ever stayed in. The rooms are big, airy, and clean, the food was superb it catered for every taste. The staff could not do more for you, from the chambermaid to the manager where all very helpful,pleasant and understanding. I'ts right on the beach, though it has large enough grounds with pool and plenty of sun beds. The area is quite but walk 500m and its lively, so you have the best of both worlds. I would go back time and again. I stayed here for my honeymoon and I absolutely fell in love with the place - the area the hotel is in is quiet but very charming, you go out the back entrance of the hotel and you are directly onto the beach, the front entrance takes you to the lovely shops and restaurants. I particularly loved wandering around all the small shops in the evening time - the atmosphere here is so laid back and friendly. The staff couldn't do enough for us, they originally tried to put us in a twin room, however I quickly pointed out this was our honeymoon and begged for another room which they did immediately - they then proceeded to put champagne and fruit baskets, chocolate etc into the room before we were taken to it. The staff were all very nice and helpful, the food was excellent and the area is amazing. We took a couple of tours to the caves and also to Malaga (where you can also arrange a day trip to Gibraltar) if you want something a bit more lively but it is the perfect getaway if you are looking to have a nice quiet and relaxing holiday this is the place for you. Enjoy !!! We've been to this hotel twice and have had great holidays. It seems to appeal to the 50+ age bracket, probably due to the lack of entertainment but the high standard. The location is literally on the beach front and the food and accommodation are great. The only reason we go more regularly to the Riu Nautilus is due to the 1 hour transfer to Nerja from Malaga. Not much I know really, but with the Nautilus you can be at the hotel within 15 mins of leaving the airport. I would not hesitate to recommend this hotel (or the Riu chain generally).